This book presents a history of women's activism in the GOP. In the wake of the Nineteenth Amendment, Republican women set out to forge a place for themselves within the Grand Old Party. As Catherine E. Rymph explains, their often conflicting efforts over the subsequent decades would leave a mark on both conservative politics and American feminism. Part of an emerging body of work on women's participation in partisan politics, ""Republican Women"" explores the dilemmas confronting progressive, conservative, and moderate Republican women as they sought to achieve a voice for themselves within the GOP. Rymph first examines women's grassroots organizing for the party, in the decades following the initiation of women's suffrage. She then traces Marion Martin's efforts from 1938 to 1946 to shape the National Federation of Women's Republican Clubs, the party's increasing dependence on the work of women at the grassroots in the postwar years, and the eventual mobilization of many of these women behind Barry Goldwater, in defiance of party leaders. From the flux of the party's post-Goldwater years emerged two groups of women on a collision course: a group of party insiders calling themselves feminists challenged supporters of independent Republican Phyllis Schlafly's growing movement opposing the Equal Rights Amendment. Their battles over the meanings of gender, power, and Republicanism continued earlier struggles even as they helped shape the party's fundamental transformation in the Reagan years. "A tightly focused monograph. . . . A well-researched example of how gender concerns can be integrated with political history." -- "Indiana Magazine of History"
"Well-researched and its chronological arrangement provides a coherent structure to the story. . . . A highly-readable, worthwhile history of the elite females who carved out a place for women in the GOP at the national level." "An important contribution to recent scholarship examining the relationship between feminism, conservatism, and women's political activism. . . . Will prove valuable to anyone wishing to understand the rise of conservatism as well as the place of women within the conservative movement." 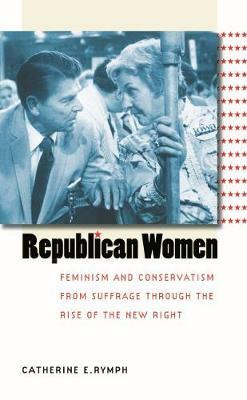 "Historians of modern conservatism and the Republican Party would be well served to read Rymph's book, as she sheds light on an understudied aspect of the GOP. . . . A highly-readable, worthwhile history of the elite females who carved out a place for women in the GOP at the national level."